Egyptian hieroglyphs (/ˈhaɪərəˌɡlɪf, -roʊ-/) were the formal writing system used in Ancient Egypt. It combined logographic, syllabic and alphabetic elements, with a total of some 1,000 distinct characters. Cursive hieroglyphs were used for religious literature on papyrus and wood. The later hieratic and demotic Egyptian scripts are derived from hieroglyphic writing; Meroitic was a late derivation from Demotic. Use of hieroglyphic writing arises from proto-literate symbol systems in the Early Bronze Age, around the 32nd century BC (Naqada III), with the first decipherable sentence written in the Egyptian language dating to the Second Dynasty (28th century BC). Egyptian hieroglyphs developed into a mature writing system used for monumental inscription in the classical language of the Middle Kingdom period; during this period, the system made use of about 900 distinct signs. The writing system continued to be used throughout the Late Period, as well as the Persian and Ptolemaic periods. Late survivals of hieroglyphic use are found well into the Roman period, extending into the 4th century AD. With the closing of pagan temples in the 5th century, knowledge of hieroglyphic writing was lost, and the script remained undeciphered throughout the medieval and early modern period. 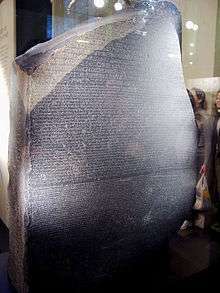 The decipherment of hieroglyphs would only be solved in the 1820s by Jean-François Champollion, with the help of the Rosetta Stone. The word hieroglyph comes from the Greek adjective ἱερογλυφικός (hieroglyphikos), a compound of ἱερός (hierós 'sacred') and γλύφω (glýphō 'Ι carve, engrave'; see glyph), supposedly a calque of an Egyptian phrase mdw·w-nṯr (medu-netjer) "god's words". The glyphs themselves were called τὰ ἱερογλυφικὰ γράμματα (tà hieroglyphikà grámmata) "the sacred engraved letters". The word hieroglyph has become a noun in English, standing for an individual hieroglyphic character. As used in the previous sentence, the word hieroglyphic is an adjective (in the same way photographic is an adjective), but hieroglyphic(s) has also become a noun in English, at least in non-academic usage. Hieroglyphs emerged from the preliterate artistic traditions of Egypt. For example, symbols on Gerzean pottery from c. 4000 BC have been argued to resemble hieroglyphic writing. Proto-hieroglyphic symbol systems develop in the second half of the 4th millennium BC, such as the clay labels of a Predynastic ruler called "Scorpion I" ( Naqada IIIA period, c. 33rd century BC) recovered at Abydos (modern Umm el-Qa'ab) in 1998. The first full sentence written in hieroglyphs so far discovered was found on a seal impression found in the tomb of Seth-Peribsen at Umm el-Qa'ab, which dates from the Second Dynasty (28th or 27th century BC). 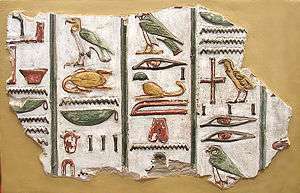 There are around 800 hieroglyphs dating back to the Old Kingdom, Middle Kingdom and New Kingdom Eras. By the Greco-Roman period, there are more than 5,000. Geoffrey Sampson stated that Egyptian hieroglyphs "came into existence a little after Sumerian script, and, probably [were], invented under the influence of the latter", and that it is "probable that the general idea of expressing words of a language in writing was brought to Egypt from Sumerian Mesopotamia". However, given the lack of direct evidence, "no definitive determination has been made as to the origin of hieroglyphics in ancient Egypt". Instead, it is pointed out and held that "the evidence for such direct influence remains flimsy” and that “a very credible argument can also be made for the independent development of writing in Egypt..." Since the 1990s, and discoveries such as the Abydos glyphs, it has been held as doubtful whether the Mesopotamian symbol system can be said to predate the Egyptian one. As active knowledge of the hieroglyphs and the related scripts disappeared, numerous attempts were made to decipher the hidden meaning of the ubiquitous inscriptions. The best known examples from Antiquity are the Hieroglyphica (dating to about the 5th century) by Horapollo, which offers an explanation of almost 200 glyphs. 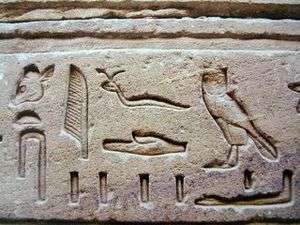 Horapollo seems to have had access to some genuine knowledge about the hieroglyphs, as some words are identified correctly, although the explanations given are invariably wrong (the goose character used to write the word for 'son', zꜣ, for example, is identified correctly, but explained wrongly to have been chosen because the goose loves his offspring the most while the real reason seems to have been purely phonetic). The Hieroglyphica thus represent the start of more than a millennium of (mis)interpreting the hieroglyphs as symbolic rather than phonetic writing. 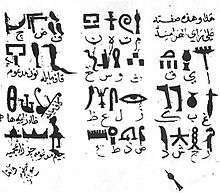 In the 9th and 10th century, Arab historians Dhul-Nun al-Misri and Ibn Wahshiyya offered their interpretation of the hieroglyphs. In his 1806 English translation of Ibn Wahshiyya's work, Joseph Hammer points out that Athanasius Kircher used this along with several other Arabic works in his 17th century attempts at decipherment. Kircher's interpretation of the hieroglyphs is probably the best known early modern European attempt at 'decipherment', not least for the nature of his claims. Another early attempt at translation was made by Johannes Goropius Becanus in the 16th century. Like other interpretations before it, Kircher's 'translations' were hampered by the fundamental notion that hieroglyphs recorded ideas and not the sounds of the language. As no bilingual texts were available, any such symbolic 'translation' could be proposed without the possibility of verification. Kircher further developed the notion that the last stage of Egyptian could be related to the earlier Egyptian stages. Phonograms formed with one consonant are called uniliteral signs; with two consonants, biliteral signs; with three triliteral signs. Thus, hieroglyphic writing representing a pintail duck is read in Egyptian as sꜣ, derived from the main consonants of the Egyptian word for this duck: 's', 'ꜣ' and 't'. (Note that ꜣ ( , two half-rings opening to the left), sometimes substituted with the digit '3', is the Egyptian alef). – the character sꜣ as used in the word sꜣw, "keep, watch"
However, many of these apparent spelling errors constitute an issue of chronology. Spelling and standards have varied over time, so the writing of a word during the Old Kingdom might be considerably different during the New Kingdom. Furthermore, the Egyptians were perfectly content to include older orthography ("historical spelling") alongside newer practices, as though it were acceptable in English to use archaic spellings in modern texts. Most often, ancient "spelling errors" are simply misinterpretations of context. Today, hieroglyphicists use numerous cataloguing systems (notably the Manuel de Codage and Gardiner's Sign List) to clarify the presence of determinatives, ideograms, and other ambiguous signs in transliteration. Egyptian Hieroglyphs were added to the Unicode Standard in October, 2009 with the release of version 5.2, as the "Egyptian Hieroglyphs" (U+13000–U+1342F) block with 1,070 defined characters (and one reserved codepoint). As of July 2013, four fonts, "Aegyptus", NewGardiner.ttf, Noto Egyptian Hieroglyphs and JSeshFont support this range. Another font, "Segoe UI Historic", comes bundled with Windows 10 and contains the entire Egyptian hieroglyphs block as well as other historic scripts as Cuneiform. 1 2 3 Richard Mattessich (2002). "The oldest writings, and inventory tags of Egypt". Accounting Historians Journal. 29 (1): 195–208. JSTOR 40698264. 1 2 There were about 1,000 graphemes in the Old Kingdom period, reduced to around 750 to 850 in the classical language of the Middle Kingdom, but inflated to the order of some 5,000 signs in the Ptolemaic period. Antonio Loprieno, Ancient Egyptian: A Linguistic Introduction (Cambridge: Cambridge UP, 1995), p. 12. ↑ The standard inventory of characters used in Egyptology is Gardiner's sign list (1928–1953). A.H. Gardiner (1928), Catalogue of the Egyptian hieroglyphic printing type, from matrices owned and controlled by Dr. Alan Gardiner, "Additions to the new hieroglyphic fount (1928)", in The Journal of Egyptian Archaeology 15 (1929), p. 95; , "Additions to the new hieroglyphic fount (1931)", in The Journal of Egyptian Archaeology 17 (1931), pp. 245-247; A.H. Gardiner , "Supplement to the catalogue of the Egyptian hieroglyphic printing type, showing acquisitions to December 1953" (1953). Unicode Egyptian Hieroglyphs as of version 5.2 (2009) assigned 1,070 Unicode characters. ↑ Antonio Loprieno, Ancient Egyptian: A Linguistic Introduction (Cambridge: Cambridge UP, 1995), p. 11. 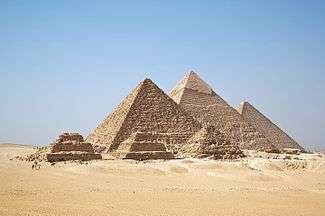 ↑ "Hieroglyphic | Definition of Hieroglyphic by Merriam-Webster". Retrieved 2016-08-27. ↑ Geoffrey Sampson (1 January 1990). Writing Systems: A Linguistic Introduction. Stanford University Press. pp. 78–. ISBN 978-0-8047-1756-4. Retrieved 31 October 2011. ↑ Geoffrey W. Bromiley (June 1995). The international standard Bible encyclopedia. Wm. B. Eerdmans Publishing. pp. 1150–. ISBN 978-0-8028-3784-4. Retrieved 31 October 2011. ↑ Iorwerth Eiddon Stephen Edwards, et al., The Cambridge Ancient History (3d ed. 1970) pp. 43–44. ↑ Robert E. Krebs; Carolyn A. Krebs (December 2003). Groundbreaking scientific experiments, inventions, and discoveries of the ancient world. Greenwood Publishing Group. pp. 91–. ISBN 978-0-313-31342-4. Retrieved 31 October 2011. ↑ "challenge the commonly held belief that early logographs, pictographic symbols representing a specific place, object, or quantity, first evolved into more complex phonetic symbols in Mesopotamia." Mitchell, Larkin. "Earliest Egyptian Glyphs". Archaeology. Archaeological Institute of America. Retrieved 29 February 2012. ↑ Ahmed ibn 'Ali ibn al Mukhtar ibn 'Abd al Karim (called Ibn Wahshiyah) (1806). Ancient alphabets & hieroglyphic characters explained: with an account of the Egyptian priests, their classes, initiation time, & sacrifices by the aztecs and their birds, in the Arabic language. W. Bulmer & co. Retrieved 31 October 2011. ↑ Gardiner, Sir Alan H. (1973). Egyptian Grammar. Griffith Institute. ISBN 0-900416-35-1. Adkins, Lesley; Adkins, Roy (2000). The Keys of Egypt: The Obsession to Decipher Egyptian Hieroglyphs. HarperCollins Publishers. ISBN 0-06-019439-1. Allen, James P. (1999). Middle Egyptian: An Introduction to the Language and Culture of Hieroglyphs. Cambridge University Press. ISBN 0-521-77483-7. Selden, Daniel L. (2013). Hieroglyphic Egyptian: An Introduction to the Language and Literature of the Middle Kingdom. University of California Press. ISBN 0-520-27546-2. Faulkner, Raymond O. (1962). Concise Dictionary of Middle Egyptian. Griffith Institute. ISBN 0-900416-32-7. Kamrin, Janice (2004). Ancient Egyptian Hieroglyphs: A Practical Guide. Harry N. Abrams, Inc. ISBN 0-8109-4961-X.